No, paramotor is not a sport in the paralympics. Dummy’s guide on flying using a paramotor. Get at least 4 friends to help you with your parachute. They are available at the nearest department store. Friends, not the parachute. 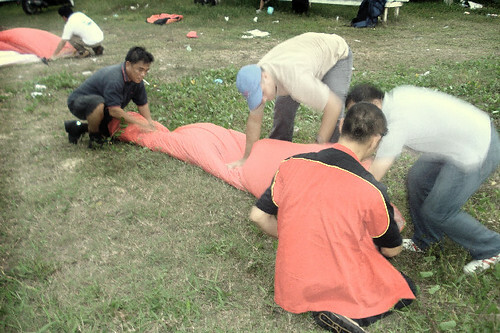 They will help in matters of unfolding the wide span of the parachute. Go to the nearest beach, or any windy spot. 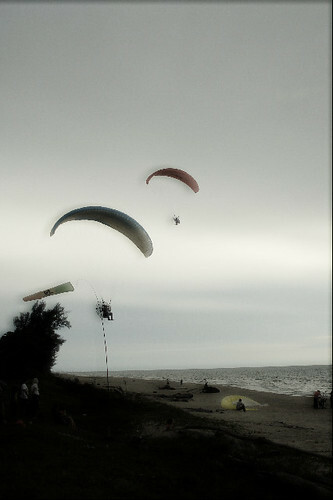 Paramotor, unless you have wings, will unfortunately not work without strong wind. Get the motor, something Wikipedia describes as “a frame that combines the motor, propeller, harness (with integrated seat) and cage”. Attempts to fly is pointless without above machinery. Caution: It’s heavy. Get the aforementioned friends to help you get up. Once your parachute is straightened out, and you’ve caught the perfect gust of wind run as your little legs could carry you, and TAKE OFF! Show off as much as possible to the spectators. Believe me, they will be staring. 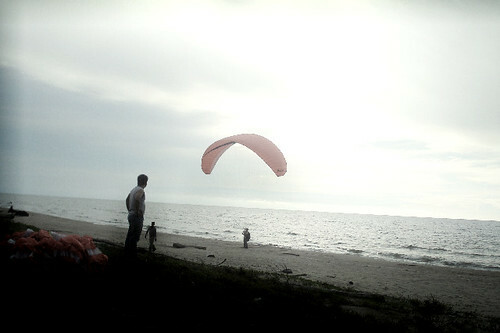 For more pictures of the Brunei paramotor experience, stroll on over here and meet Pegasus. Of course, if you would just like to see a certain blogger and a certain DJ frolick at the beach merrily on quartbikes (sp?) (or ATVs are they called?) while watching the boys up in the air, click here, here or here. Hi Maureen, just a note that Paramotor is another individual association. 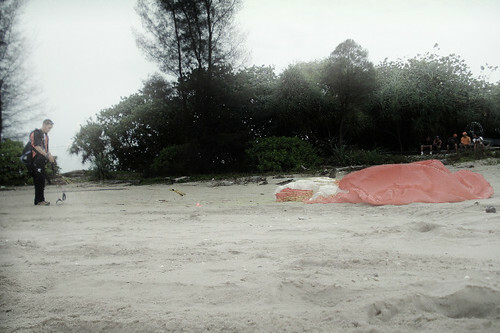 It is not part of Persatuan Gemilang but the background history was…… Kindly refer to Tango 2 and Tango 3 (driver) for more info… and btw, its a powered paragliding sport… and for more conclusions and deeper meaning of it… click this : – http://en.wikipedia.org/wiki/Paragliding. It is called powered paragliding in US and its called paramotor in UK…. Mamat, awu mun kan join bari kurus pulang tu! Haha. Great to meet u (finally) as well! Lin, aiseh nama baru tu Maureen. Anyway, thanks for the information, selama ani I thought it’s part of Gemilang. Will make necessary corections. 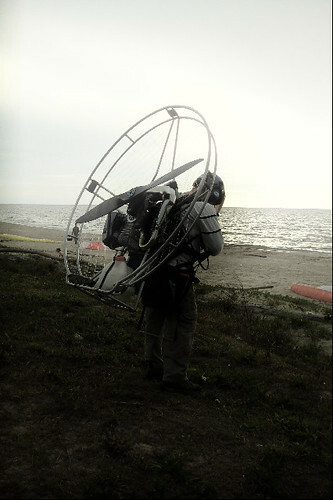 🙂 Know of any website I can link to so readers can get more information on paramotor in Brunei? Thanks MAUREEN, kinda like the new name, MAUREEN. Thank you for the post. Thank you for linking it to RP Website too. Yup, guess LIN is right. Paramotor Association (PA) constitutionally facilitates members to safely and legallise paramotor operations. Please do not misunderstood, any other organisations or groups suchs Minisitries, schools, other associations can conduct this paramotor activity providing they are under the umbrella of Paramotor Association, ie registered as a member of PA, inorder to be valid and as part of the constitution. The Website URL has already been approved, thanks to TelBru, PA will be launching its website soon. RP’s Website is just a collection of nice pictures of the Paramotor Flying and some blogs once in a while. Yeah, banar, if your are into the ground training, you can really lose weight, believe me…. Dreamed about flying? lets run Into the Sky. If youre motivated by desire rather than by fear, the sky is yours. 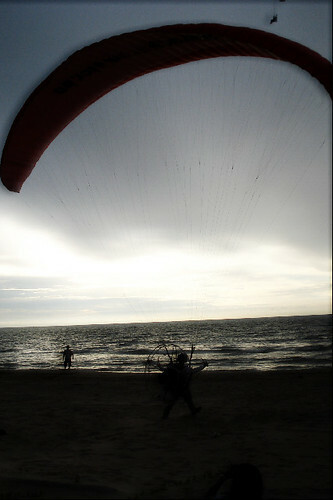 I need to be in touch withe the paramotor Brunei as we’re producing a tvc. can i have their number and contact person details? Hey – whats up. Thanks for the info. I’ve been digging around looking some info up for shool, but there is so much out there. Google lead me here – good for you i suppose! Keep up the good work. I will be coming back over here in a couple of days to see if there is any more info. Hey – whats up. Thanks a bunch for the blog. I’ve been digging around looking some info up for shool, but there is so much out there. Google lead me here – good for you i suppose! Keep up the great information. I will be popping back over in a few days to see if there is updated posts. Hi , i am interested in taking up paramotoring lessons in Brunei, can someone please give me a contact number to contact an instructor.thanx.